There are brands that are cool — and there are brands that just aren’t. In my opinion (the right one), Apple is one such cool brand. There’s just something about Apple that gets to me. Maybe it’s the icon? Design? Marketing? Or black magic? Honestly, I just don’t care. I just appreciate the fact that it’s cool, and that they don’t have to go to the extent of making ghetto rap “anthems” like HTC. HTC recently released its trademark anthem called “Hold The Crown” (written and performed by the unimportant Doc G). Get it? Hold The Crown? HTC? After watching the video, you might have many unanswered questions — not just about the video, but also about life itself. But don’t worry; you aren’t alone, because so have I. What on earth were they thinking? Are they really that desperate? Honestly, I just don’t know. What I do know is that someone needs to get fired. You may think I’m overreacting, but I’m not. What was HTC thinking? Were they trying to mock Apple and Samsung? No, they weren’t — they were mocking themselves. They just ruined their possibility of ever being cool, let alone becoming like Apple. Regardless of how moronic an idea it was to make the anthem, here are a few punch lines worth remembering — or laughing at. No, you don’t. Not after this video, anyway. I guess I can let you have this. Of course! Extreme Power Saving Mode is a total deal-maker. We knew that already. We all did; and I can confidently say that HTC is going to make more money from the clicks they get on their YouTube video, than they will from selling their phones. 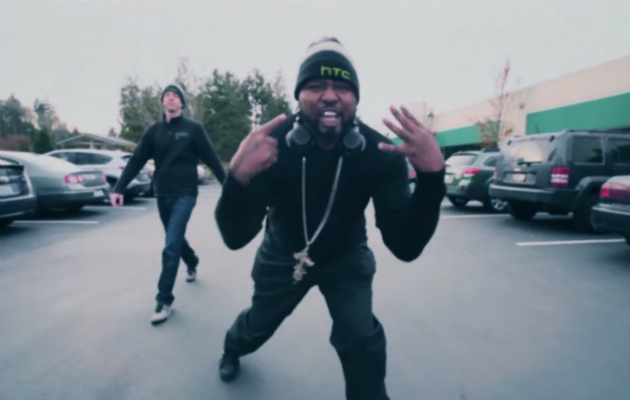 If the rap video wasn’t enough, HTC also uploaded an interview with the P.M. Dawn rapper, Doc G. Have a good laugh! If they wanted to be funny, they should have just hired a comedian; not a rapper that never went platinum. HTC: the damage has been done, so I suggest you take a seat at the nerd table. Oh, look! You already made a new friend — HTC, say hello to Blackberry.